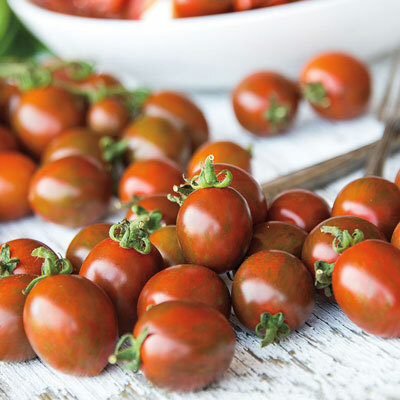 Chocolate Sprinkles Tomato | Henry Field's Seed & Nursery Co.
A striped grape tomato that's as wonderful as its name! Bears clusters of large grape tomatoes with rich, sweet-tart flavor, glossy brick red color with dark green striping, and disease resistance. Plus, it resists cracking! An early variety, it produces high yields. A hands-down favorite for fresh eating and for making a delicious Caprese salad. Indeterminate. Disease resistance: FNT. 70 DAYS. Depth: Seeds 1/4 inch deep. Plants should be planted deeper than in the pot. Plant them just below the first set of leaves. Spread: 3 - 4 feet. Days To Maturity: 70 days from transplant. Flower Form: Small yellow flowers. Soil Requirements: Well-drained, rich soil. Fruit: 1.5 inch bite sized fruit. Red with green stripes. Rich robust flavor.